A few moons back I asked for your recommendations on reading and Hunger Games popped up last week in the rotation. Hearted it. I knew I would because it's for young adults. You see, there's a special part of my brain reserved for Twilight, VC Andrews and Sweet Valley High. Yeah, really. 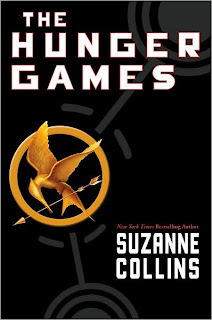 Hunger Games is a scifi novel about a post-apocalyptic world where an annual event pits district representatives of the teen nature against each other in a contest for survival. Addictive. I've already shared my passion for educational games played exclusively on beige bulky boxes. This unfortunately "fake" movie trailer provides many nods to a game I now play on my iPhone. LOL moment? cemetery plots. So You Think You Can Dance wraps this week. Sadness. But it continues to introduce me to music that gets my muffin moving all through the house. This week was Janelle Monáe who sings the fabulous Tightrope. Her album, The ArchAndroid, is filled with delightful cuts including the must-download Cold War. Haha, just a couple of days ago, I was thinking about all the adolescent lit/YA stuff I loved when I was a tender young thing -- and wondering if I should revisit some of the classics. Judy Blume was my pensive pre-teen drug of choice. ->l: Oooh. Judy Blume should also be on my list. S: We should go to therapy together.